Making a trip to the casino isn’t just about winning or losing, it’s also about enjoying your time while you are at the casino. This is especially true when it comes to playing slot machines, where the losing frequently outnumbers the winning and it the entertainment value that keeps players coming back for more each week. While other players also come to the casino to have fun, there are times when the interests of players creates a conflict between other players in the casino. During those times, there are certain rules that have been laid out and need to be followed to ensure one player’s experience does not interfere with another’s. Here, we are going to discuss the rules of etiquette while playing at a casino, so that our idea of a good time does not interfere with another players and vice versa, and so that neither of us interfere with the employees that are working at the casino. It should be noted that these rules of etiquette mostly apply to the live casinos where interacting with other people cannot be avoided. There is nothing wrong with playing more than one slot machines, especially if there are not many people around. But, when a casino floor is busy, it is best to limit yourself to a single slot machine or casino game. Many casinos also have signs that ask players to limit themselves to a single machine during busy days. Playing on multiple machines is more common with the three-reel slots as compared to the multiline video slots. This enables players to play an entire row of slots, hitting the max button on one game while the other is still spinning. This strategy is fine just as long as there is adequate space available in the casino, and if you are not coming in the way of other players who want to use the slot machine. If there is more than one person who is waiting in line, it’s better to stick to your machine and give other players a chance at playing the slots as well. only have a single seat for each game. So, if you take the seat, but aren’t playing the slot machine, you are keeping someone else from playing the slot. This not only denies other people from playing on that slot machine, but also stops the machine from doing its job, which is to make money for the casino. A slot machine that is not being played can generate no revenue. It is natural for people to take some rest after spending a while at the casino, which is why casinos usually have lounges where visitors can sit and have a snack while they relax. That being said, if a casino isn’t busy, nobody is going to split hairs on your decision to sit on a seat of an empty slot machine, but if there are many people around, its best to head for the lounge. Likewise, it is impolite for other people who are accompanying a player to sit around on other seats while watching. Other people who want to play should not have to stand and wait for those who are watching the game to give up their seat. So, the next time you go to the slots section at a casino, remember that the seats are for players. Answering nature’s call is important, even when you are at a casino. Players often take toilet breaks, and with casinos that have self-serve beverage dispensers, people are also going to take short breaks to get a drink. While there are some slot manufacturers who have built their slot machines with a “waiting” mode which pauses the game for as much as 20 minutes, more than enough for the player to return back to their game. 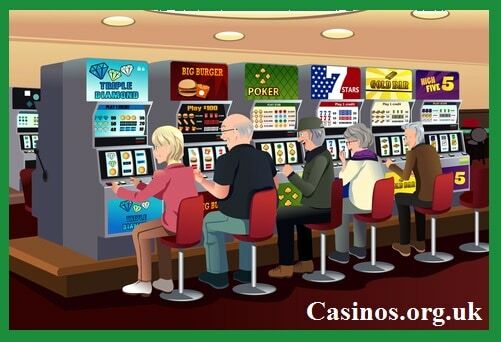 There are many slot machines which do not feature this option, leaving slot players with no proper way of leaving a sign that they will be coming back to avoid someone else from sitting on their slot machine. For many years, a common signal which was used by many slot players at live land based casinos was to place a coin cup on top of the video screen or over the handle that controls the reel. But, now since payoffs are no longer given in coins, there is no use of coin cups. The ‘waiting-mode’ mentioned earlier is not popular in the US so there’s no way of pausing the game. But, one sign which is widely accepted by all slot players within the UK & US is to tip the seat of a slot machine forward so that its back rests on the machine, telling others that the slot machine is occupied. Slot players in the UK also often leave behind a personal but inexpensive item on the slot machine, such as their club card, cigarette or a drink. But, if there are others on the same bank of slot machines it is okay to ask one of them to watch your game for you while you’re gone. However, if you do that, it is important to keep in mind that if this person has to leave for any reason, they aren’t obligated to watch your machine until you get back. It is also important to not leave anything that is of value behind as a sign that the slot machine is occupied and that you will be returning. If you decide to leave behind your wallet or purse, don’t be surprised if it’s not there when you return. Also, it is not advised to leave credits on the slot machine unless you are with somebody who can watch the game for you while you are away. This is because with the introduction of tickets that have replaced the coins, a thief can easily cash in your credits without you knowing. Player’s Club cards being left behind on machines is commonplace at the casino, which is why it is no use to leave your Player’s Club Card in the card reader of the slot machine you are playing as a sign that you are going to return to the machine. Even if you mean to come back and left your Player’s Club card in the machine, don’t be surprised if there is another person playing on the slot machine, because the other player would not be at fault in this situation. While you can politely ask the other player if they would give the game back to you, but you cannot throw a tantrum if they refuse. On the flipside, if you see somebody else’s Player’s Club card on the machine that you are about to play, it is okay to go ahead and play the slot machine. You can take the card out of the reader and place it on top of the machine so that they are able to collect the card whenever they return. Leaving your slot machine for a few minutes is fine if you need to take care of personal needs, but leaving the machine for an hour before you return is not cool. If you are in no mood of playing on the slot machine any further, the polite thing to do is to leave it for another player. If you are allowed to smoke at the casino where you happen to be in, then its fine, but, you would also want to be a little courteous to the other players who are around you and who are not smoking. While the is one of those etiquettes that most smokers practice as a matter of course, but there are times when certain transgressions leads to customer complaints and even uncomfortable confrontations. So, the next time you are smoking in a casino, regardless of whether it is allowed or not, don’t go blowing smoke in other people’s face, but rather, turn away from others while exhaling the smoke. Also, keep your ashtray on your own slot machine rather than reaching out towards the ashtray on another player’s slot machine to flick your ash. While we’re on the topic, it is also best if you always use an ashtray when you are smoking. It is not nice to leave ash on the keys or on the game tray when you leave. And the most important of all, do not smoke in areas in the casinos that have been designated no-smoking areas. In those areas in the casino where smoking is permitted, but set aside certain areas for the non-smokers, there is no need for you to go to those areas while you’re smoking. There is plenty of options available at the casino for you to use instead. You also would not want to smoke in a non-smoking casino, or else you will most probably be asked to either put the cigarette our or leave the premises, which is always embarrassing. For instance, in the State of Illinois, smoking in public places is banned, and that includes casinos too. So, if you are caught smoking, you would not only be irritating the other people around you, but you will also get yourself in trouble with state law and will have to pay a fine or get arrested. Tipping is often a sensitive issue regardless of where you are. When it comes to landbased casinos, most of the tipping usually occurs while playing the table games, but there are few instances where slot players also have to deal with tipping casino personnel. This normally happens when you are playing on machines with hand-paid jackpots. Most of the slot machines that you will find at casinos today will make payoffs by adding credits to the meter. But, when it comes to the large slots jackpots, they are usually paid by a designated slot attendant or a supervisor, who is accompanied by a security guard, since the payoff is usually a large sum. The tips in these situations are always optional. Players do not have to tip if they do not want to, but it is not uncommon for slot players to tip casino personnel after getting large hand pays. The answer to this question is usually open-ended, because there is no fixed amount for the tip. Generally, slot players tip around £20 when they win a £1,000 jackpot. Sometimes, the slot attendants hope to get a tip. For instance, they can give you nine £100 bills and five £20, in the hope that they will get one of those £20 bills as a tip. But, the decision is ultimately up to the player. Also, it is not necessary for players to tip £20 on a £1,000 jackpot, they can also tip the attendant with £5 or £10 as well, which will without a doubt be graciously accepted. Sometimes, even tipping is not that simple. For instance, you could find yourself having to deal with multiple attendants while getting paid. In such a situation, it is your call. 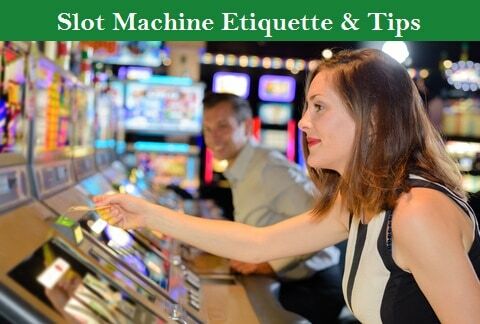 It is also important for those who want to tip the guards that accompany the slot attendant to first ask the guard if they are allowed to accept tips from players. While some casinos allow the guards to accept tips from the players, others do not. The slot managers or executives that will also be present are not allowed to accept any tips. But, if you do want to offer them a tip, ask first. Slot managers and executives will usually politely refuse to accept any tips from the players since they are paid better than the slot attendants, and they are not reliant on tips. At the end of the day, you won the money so it’s yours, and it’s your wish whether you want to tip the slot attendants or not. Nobody goes to a casino not to have fun that includes slot players as well. So, it is important to keep things friendly during your stay at the casino. This is important regardless of whether you are winning or losing. Since confrontations between players are a more common occurrence of players on table games as compared to the slots, arguments do break out for some of the reasons that have been mentioned earlier, such as smoking or leaving your game without any proper sign that you will return. But, other than that, slot players really cannot argue or accuse another player for missing a shot or ruining their chances of winning the jackpot. It is important to remember that even when those uncomfortable encroachments, or not-so-polite hustling or bumps or spills occur, dealing with the matter politely is always the best way forward. When it comes to playing slot machines, sometimes some common courtesy can work wonders for both the parties involved, and will prevent the casino employee from having to come in and resolve the situation for you. Along with being friendly and polite with other payers, it is also best if you did the same with casino employees as well. So, whether you are being paid by hand or are signing up to get a Player’s Club card, or you are making a request for a comp, don’t forget that you are receiving a service by the casino employee and they deserve the same respect you do. All casino personnel wear name tags, so it helps if you called them by name when asking for something. Every casino, regardless of its size trains their staff to be polite and courteous when dealing with visitors. So, if a casino employee tells you that there is nothing they can do, there’s no need for you to yell. And if the slot attendant is not able to provide you with an answer that is satisfactory, it is alright to ask for their supervisor politely. It is important to remember that a respectful request will always bring you a favorable answer wherever you are. It’s true that your interactions with other players will be at its minimum while playing online slots, since you will be either playing the slots on your computer on online device. But, there are many online casinos that provide live chat services to their customers, in which case you will need to be courteous and polite to whoever it is you are speaking or chatting with. If you find that the online casino that you choose does offer a live chat service to the players, then the same rules of etiquette will apply when you converse or interact with casino personnel in land based, and live dealer casinos. It is important to always be polite, be respectful and be courteous in your interactions with the chat personnel of the online casino. A major problem with the chat services of online casinos arises when players use it to promote third party products. In which case the online casino that’s hosting your play has the full right to stop individuals from using their platform for their own marketing purposes. It is important to remember that an online chat service is solely for sending friendly messages, interacting with other players and sharing casino stories, and not for marketing your own products. Showing respect for other players is the key to enjoying your time at live casinos. Remember not to keep other players from playing the slots by taking extra chairs. If you wish to leave a slot machine you are playing to answer nature’s call or get a drink, always leave a sign that you will be returning back, and always keep your breaks as short as possible.